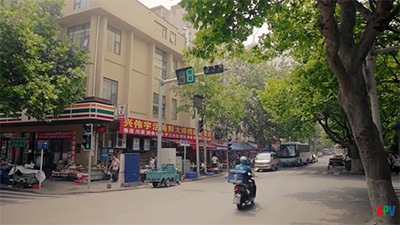 This film has been produced to celebrate the centenary of James Fletcher-Watson, who died in 2004. It gives an insight into James and his life and includes interviews with his painting friends and family, along with early images of him and his work. 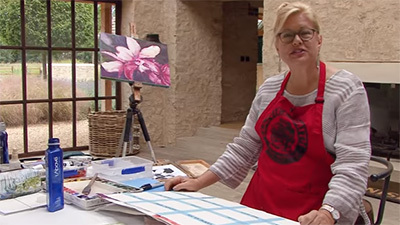 It illustrates his love of sketching and painting outdoors, with previously unseen footage — a pencil sketch in the Cotswolds, a painting of Cley Mill in Norfolk and a tree study from the Lake District. This is a fascinating look at the life of a great painter who believed passionately in passing on the pure watercolour tradition. Watching this film was quite an emotional experience, because I hadn’t fully realised just how much I miss James. 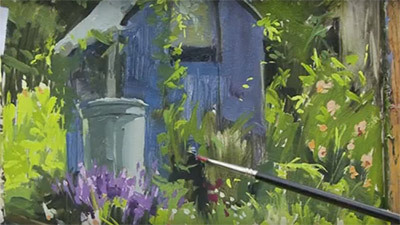 His gentle approach to painting and teaching always left you wanting more and his encouragement – he always had a good word to say for everyone – meant that no one went away from one of his courses feeling disheartened. When an artist leaves us, it’s usually better to let their work speak for them and to allow new generations to find and interpret it as they will. Constant revisiting all too often does them no favours; if there’s a market for their books or DVDs, that’s fine, but repackaging can just look like cashing in. This affectionate portrait of a much-loved man strikes just the right balance, however. With the advent of the DVD, films have tended to get longer but, at just about the hour, this is sufficiently tightly edited that everything that needs to be said gets said without being laboured and repeated. 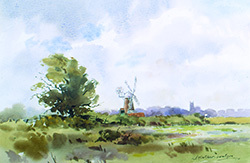 There is also room for film of James himself, including two full demonstrations – a tree study in the Lake District and a painting of Cley Mill in Norfolk – that haven’t appeared before. You have to ask yourself why, as these by no means have the feeling of outtakes or things that really should have remained on the cutting-room floor, and they justify the price of what could all too easily have become a hagiography if it wasn’t so well handled and edited. Painting and talking at the same time is by no means an easy thing to do, but James was a natural and he keeps up a constant commentary, narrative and stream of anecdote throughout. 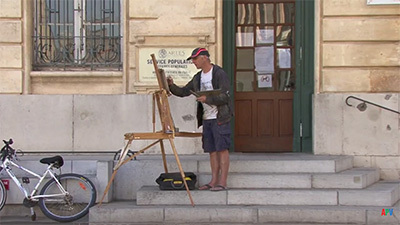 He’s always interesting and to the point and produces a good painting and a coherent story at the same time. This skill he undoubtedly learnt from Edward Wesson, whose successor he very much was. Wesson, indeed, urged him to take over his courses when he could no longer go on with them. The film begins with the story of James’s life, with contributions from his daughters Vanessa Whinney and Josephine Neil, who describe his development as both a man and an artist. These are complemented by contributions from his wife Gill, whose ability as a raconteur and dry sense of humour come through to the full. 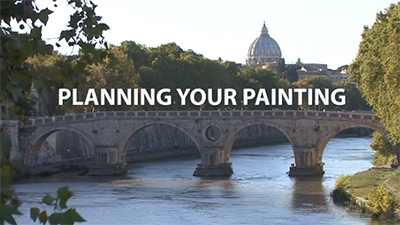 David Curtis and Robert Wade offer a critique of what James meant to the world of painting. (Gosh, that sounds dull. Just as his family bring James to life as a man, they bring him to life as an artist). I was also much amused by the revelation that so much of James’s work was concentrated around the Windrush valley because that was where his dog walking took him! It’s details like that which make this film sparkle. 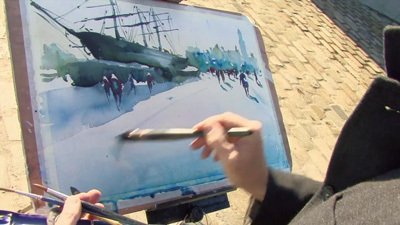 An added bonus is the generous gallery of paintings from all periods of James’s life that are included in the DVD content. And, as a personal footnote, I was intrigued to discover that James (a trained and practising architect) designed runways in north-west India in the Second World War at a time when my own father was serving there with the RAF. Devotees of James Fletcher Watson's gentle style of teaching and encouragement - he had a good word to say for everyone – will need no further prompting to add this affectionate tribute to their collection. Those who are new to one of the greats of 2Oth-century pure watercolour will find not only an explanation of why he inspired such love, from both his family and from artists such as David Curtis and Robert Wade, but also previously unseen footage from films made during his lifetime. This includes a tree study in the Lake District and a painting of Cley Mill in Norfolk that becomes a fascinating lesson in art and landscape history. These lengthy extracts are completely fresh and have no feeling of being out-takes, as you might fear. This film sums up the character of both the man and of his work and is a fitting tribute on his centenary. 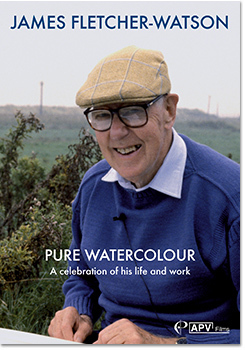 To mark the centenary of the much loved artist, James Fletcher-Watson, APV has produced Pure Watercolour: A Celebration of his Life and Work. 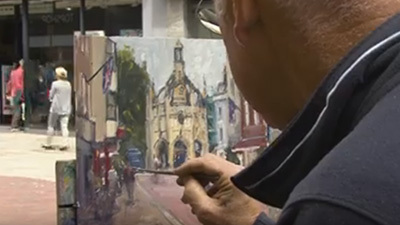 The DVD, which contains previously unseen footage, gives a fascinating insight into the artist's life, including interviews with his painting friends and family. 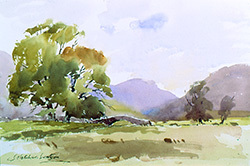 A pencil sketch in the Cotswolds, a painting of Cley Mill in Norfolk and a tree study from the Lake District illustrate why James's work and his love of pure watercolour was held in such high regard by fellow artists.